Like all kids, mine love crackers. And crackers are expensive and filled with salt and preservatives. So, I picked up a book on making your own crackers. One recipe looked very promising but it called for this strange ingredient called Za'atar. 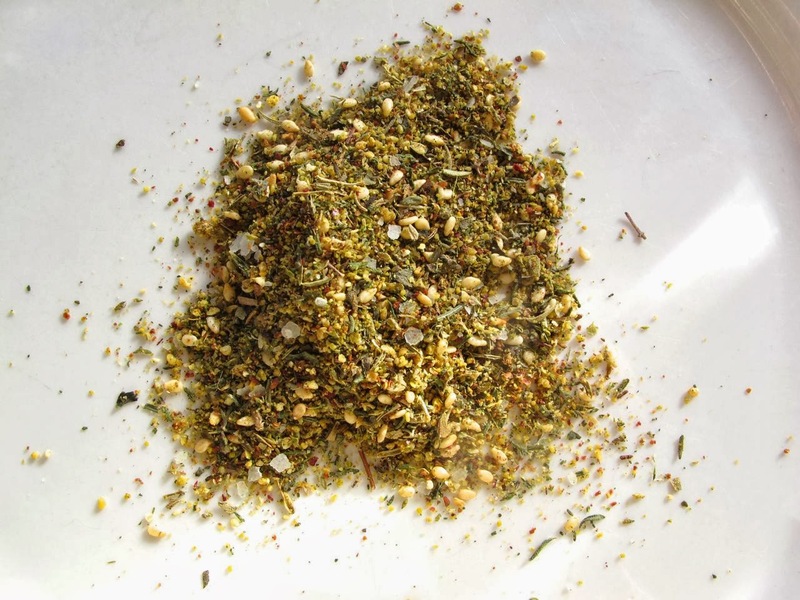 Turns out Za'atar is a spice mix. The most incredible spice mix ever to exist in the world of spice mixes. Seriously, it is. It makes Herbs du Provence or any Italian seasoning look and taste like sand. Aromatic in the way that a Turkish spice bazaar must smell - exotic and slightly familiar and nearly overwhelming with pleasure. Since its arrival in our house it has become my savoury Franks Red Hot - I put that *&$# on everything. Scrambled eggs, roasted veggies, tomato sauce, baked chicken, cheese balls, popcorn, in a grain salad, and yes, crackers and bread. If you've never had it you need to try it. Trust me. I buy mine through Silk Road Spice Merchant, but you can also make your own blend. Thanks for reminding me about this fantastic spice blend. My husband is low salt now and this will be perfect! Another spice blend to try is garam masala. It's a Punjab spice without salt. We love it on roasted veggies and squash soup. oh, yes, it's one of my faves. we get ours at a local Lebanese grocery store. nom nom nom. Slice parsnips lengthwise, brush with an olive oil/zaatar mix, and roast in single layer for 20-30 minutes at 180C/360F. That spice sounds wonderful and making your own crackers sounds good! I love them, especially Wassa crackers (they are so good). I'm going to give them a try! thanks for the inspiration! Cool! I will definitely have to give this a try. Thanks for the blog post! Oh so yum- we discovered this stuff on a trip through the Middle East- the most memorable was in Jordan. There are 1000 variations of course. We generally just had it with pita and olive oil - dip and then dip. For breakfast with a boiled egg. Classic! Should make my own as we've long ago run out and can't find the 'real thing'/ unstale anywhere.